Our Premier Garden Sheds are designed for maximum strength and manufactured from low maintenance ribbed steel sheeting. 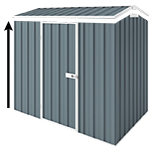 The Absco Premier is one of our most popular range of sheds. It is designed for maximum strength and manufactured from low maintenance ribbed steel sheeting. This 3m x 3m x 2m double door colorbond shed is very favoured as it suits most Aussie backyards and has a very attractive price tag. You can choose from 4 different colors - Classic Cream, Pale Eucalypt, Paperbark, and Woodland Grey. It is engineered to withstand winds of up to the wind rating of N2 (147km/h). Additional cyclone kits can be purchased to increase the wind rating to W50 which can withstand winds of up to 180km/hr. The packaging size and weight are designed to help you organise your transport if you choose our popular FREE depot delivery option. For permanent secure installation of your shed it is recommended to use anchors. To secure the walls to your concrete slab you will need 14 anchors for this shed. Great service from first contact. Fast delivery, easy to pick up from depot with my own trailer. Easy to put together until the final stage on the roof. Easily solved by drilling new holes connecting sides, flashing and roof. This is a very good product at a good price and we are very happy with the finished product. The shed was relatively easy to assemble. However, about 10-20% of the screw holes didn't match with each other. I had to use my drill. I also had to use an angle grinder to slightly reduce size of channel tubes that fit into the door frame to make them of right size. Using channels is a great idea. It significantly improves the assembly effort. HOWEVER, they accumulate water after rain. They should have drainage holes, at least the bottom ones. After the assembly and installation, the shed itself requires a significant waterproof sealing effort (from inside). If not sealed, the water will accumulate in the channels and will leak to the concrete slab too. All the stated above does not really say anything about the quality of the shed itself, however I didn't expect all that extra work I had to do. Good shed, good price, excellent service and fast delivery. They also followed up to make sure we had received the shed and to see if we needed any help with assembly etc. Delivery was on the day promised. Assembly required 2 people and my wife helped out as the product was not too heavy. The instructions were simple to read compared to some other semble it products. Great follow up and feedback process. You get many companies that only care about getting the product sold, and thats as far as it goes, but cheap sheds are bent on customer service. Timber Flooring Kit (8) to substitute concrete slab. Made from 100% Australian renewable plantation grown timber. Comes with 10 Years Warranty.